When tacks were found deliberately strewn across part of the NC500 – Scotland’s Route 66 – it sparked fears a sinister stance was being taken against bad driving by tourists. 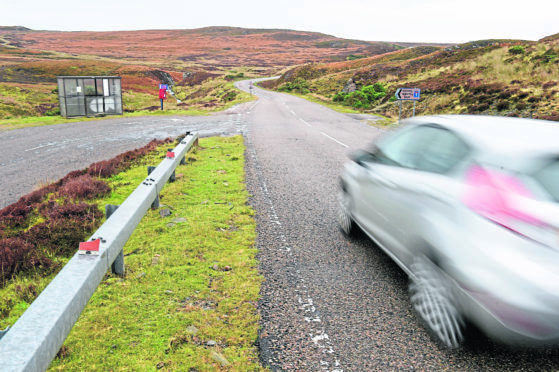 Mystery surrounds why, on four occasions this year, such a bizarre crime has been committed on a remote road between Bettyhill and Strathy in Sutherland. Various theories have been offered – from an alleged dispute between residents in a nearby village to those acting out in frustration against NC500 motorists. But whoever is to blame, and while police continue to investigate, the crime has prompted renewed calls for urgent action on roads along the route – both in tackling bad driving, particularly speeders, to carrying out repairs. Susan Malone, owner of Bettyhill Merchant Shop, said: “This has been the busiest year yet in terms of tourist numbers since NC500 began three years ago. “We can’t complain as a business – but it means the roads are much busier, which brings problems such as traffic mayhem. “The main complaint is the number of people not letting traffic past. There are lines of traffic at times. Some just don’t know how to drive campervans or reverse into a passing place. On just one day last month 85 vehicles were stopped by police patrolling the route. Cautions were issued to 45 motorists, with 12 reported to the procurator fiscal – seven of those in relation to speeding. In August police issued an appeal after four high-powered vehicles were reported driving dangerously in the Ullapool area. Organised convoys are also an issue. In mid-summer eight German-registered Porches were spotted on a stretch of road in the Strathcarron area, speeding downhill on an S-bend. On another occasion, 12 Italian-registered Minis held up traffic driving nose-to-tail near Tongue. Police were called to warn them to drive in no more than pairs. Around 24 campervans, meanwhile, were found at a standstill near Bettyhill, causing major disruption. The high volume of traffic is also having an effect on the condition of the roads, some described as “not fit for purpose”. Jim Johnston, secretary of the Bettyhill, Altnaharra and Strathnaver Community Council, said: “We feel that insufficient attention has been given to single track areas, particularly passing places. It is estimated that the popular 516-mile loop around the north coast of Scotland, starting and finishing in Inverness, generated an additional £9million to the economy in 2016, attracting an extra 29,000 visitors to the area. NC500 managing director Tom Campbell said: “The route has grown into being a 12-month destination for visitors, sustaining jobs and businesses. “It is a great economic success story for the North Highlands and we continue to work with the relevant authorities who are responsible for the roads to encourage investment in infrastructure. It has undoubtedly become an instant success since launching in 2015 – but carries with it a host of problems which need sorting. And quickly, before it falls victim to that success. One year on from gathering reaction for a story about the impact of NC500, we returned and found the same concerns and complaints – but being voiced much stronger and more angrily. This is because the route is even more popular and – as a result – the roads are busier. It was evident from our latest trip north, the tourist attraction is no longer seasonal, but is now enjoyed by visitors all year round – having witnessed around a dozen foreign-registered campervans and cars in just an hour. In October! While many of the bigger towns and villages are reaping the benefits – Inverness, Ullapool, Thurso, Wick – the smaller locations are not. This is because those in campervans stock up at supermarkets before hitting the road. Many cyclists and car travellers take camping gear, deciding not to pay for hotels or B&Bs. And while tourists have enjoyed the sights and scenery of many locations along the 516 miles, there is not much else being provided to keep them there and put their hands in their pockets. Most businesses along the route have obviously enjoyed a boom in the last three year – even if just slightly – but unless the infrastructure is sorted, these visitors might be put off from returning. Many of the roads are not fit for purpose and urgently need investment. Bad driving is also another major issue, from those going painstakingly slow and holding up the locals going about their daily business, to speeders. Many tourist are purposely hiring high-powered cars in a bid to complete the route in a superfast time, which is causing a danger in rural communities. So these need sorting, and fast. Otherwise visitors will soon decide the hassle involved will stop them from coming. As a result, the quick success story might also, quickly, fail.